Boyce Precision Engineering has officially opened its new manufacturing facility and announced plans to almost double its workforce as part of a £6.9m investment. The company has built a new facility at Charlestown Road Industrial Estate on a site purchased from Invest Northern Ireland. The investment is part of a five year project to increase its workforce, manufacturing capabilities, and grow international sales. Boyce Precision Engineering specialises in producing machined precision component parts for the aerospace interiors and pharmaceutical sectors. This includes manufacturing, machine prototyping, and tool and mould production. Invest NI offered Boyce Precision Engineering over £600,000 towards the construction of its new 18,000 sq. ft. factory, purchase of machinery, job creation and staff training. The 27 new manufacturing jobs to be recruited by 2022 will generate over £800,000 in additional annual salaries for the local economy. 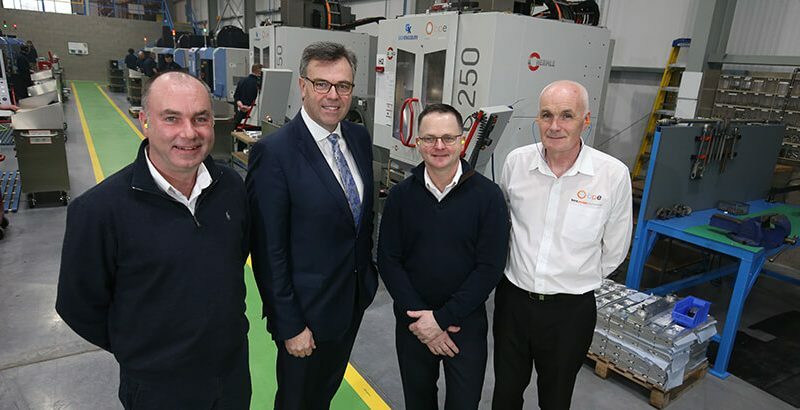 Welcoming the news, Alastair Hamilton, CEO, Invest NI added: “This major investment by Boyce Precision Engineering is a positive endorsement of the strength of Northern Ireland’s manufacturing capabilities. “Today’s factory opening marks an exciting new chapter for the company. This new facility and the creation of 27 new high value skilled jobs is encouraging news for the Portadown area. Charlestown Road is an Invest NI owned industrial estate with sites available for businesses to purchase in support of their growth or investment plans.